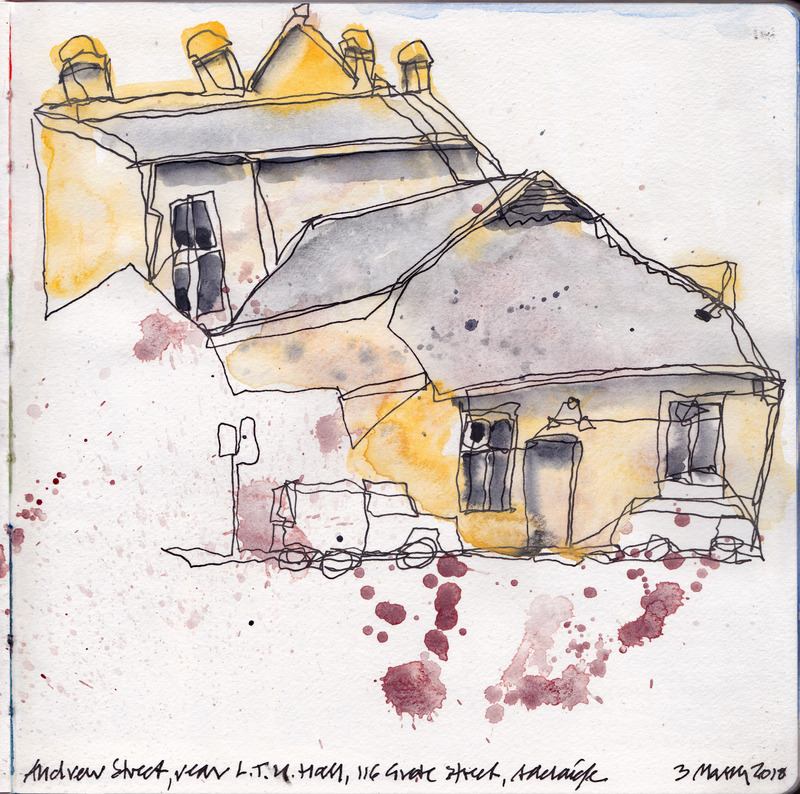 March and April (our early autumn) is a great time for sketching in southern parts of Australia—the weather is mild and settled, with the threat of 40-degree scorchers behind us (hello America, that’s 104 degrees F). And where better to start than with this country’s fine stock of old pubs. Each major city and suburban corner seems to have a large nineteenth-century hotel, giving rise to fabulous Australian slang terms such as ‘wowser’ (one who holds puritanical views on the social issues, particularly in regard to alcohol) and ‘six-o’clock swill’ (the practice of accelerated intake prior to early closing of licensed premises, introduced by wowsers in the early twentieth century but rendered obsolete since the 1960s by more progressive attitudes to food and beverage consumption). Pubs almost demand a lubricity in sketching technique, and in a quest to introduce extra looseness and expression in my urban sketching I have looked to digital image concepts translatable to hand-drawn techniques. The first is the use of vectors, and the second, of enhanced colour saturation. Vectors, continuous lines with magnitude and direction, adapt well to ink sketching. Each of these three sketches was done in one continuous line. (Well OK, I took my hand off the page for about 30 seconds every 15 minutes to stop it falling off!) This technique is a wonderful means of freeing the hand and sharpening the eye, ever alert to the next path of the vector. The other technique adapted from digital technology is the use of a highly saturated colour palette, as if the dial had been turned up on your photo editing software. Again, this guards against timidity, and sits comfortably with the looseness inherent in continuous line-work. My last sketch is not a pub, but the back of a hall, sketched in Adelaide from an unprepossessing bus park. I freely splooshed around some Mars Violet, almost like a few drops of Coonawarra Claret ’midst a merry spree. Imagine my surprise when I walked to the front only to find it was the hall of the Ladies Temperance Union! Richard Aitken is an urban sketcher, historian, and author. He is based in Melbourne but travels widely with sketchbook, pen, and watercolours, and drinks in moderation. Richard's previous guest posts: Sketching the subconscious and Do buildings have a personality?